We are focused regionally to place our local clients on the leading page of Google. 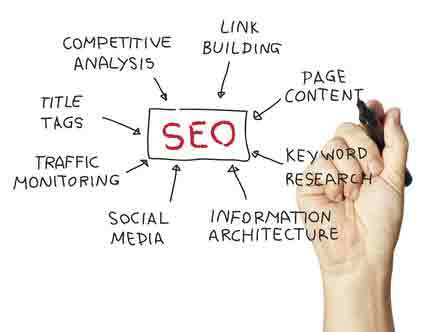 Search engine optimization (SEO) is a method to improve a website’s ranking in search engine results, which, in turn, attracts a targeted audience and increases traffic. Google is the best known search engine, but there are dozens of others.Keeping your website search-engine friendly offers an added benefit: it helps to assure that visitors will find your website to be relevant, attractive and easy to use. We offer services to maintain and constantly improve your sites SEO with regular reviews and updates. Effective search engine optimization requires both technical and marketing expertise. We understand not only how search engines work, but how your target audience uses the internet to find your company and your competitors as well as your products or services. We incorporate elements into a website’s coding, structure, content and e-commerce tools to improve its exposure. Ww also remove obstacles that block search engines from indexing your site. The results can be dramatic, and Blueprint can build into the site tools to precisely measure performance. It’s best to incorporate search engine optimization in the early stages of website development. We work step-by-step in a process that’s proven its success with our previous clients. We look at your on-page optimization and link development strategies. We study your competition. We customize our SEO packages to cater to your specific needs, goals, and budget. And we make sure that we deliver organic results consistently, so that at the end of the day you enjoy the edge that you need to succeed and rank ahead of the rest.